It is no surprise that the incredible innovator and master affinatore, Antonio Carpaneda of La Casearia Carpenedo, created the original and genuine "Sotto Cenere" cheese (meaning cheese “under ash”). Founded in the early 1900s by Ernesto Carpenedo (Antonio’s father) in the beautiful Treviso area just above Venice, La Casearia Carpenedo is one of the most celebrated affineurs in the Italian market, known around the world for their elegantly refined, imaginatively conceived cheeses, such as Perlagrigia. 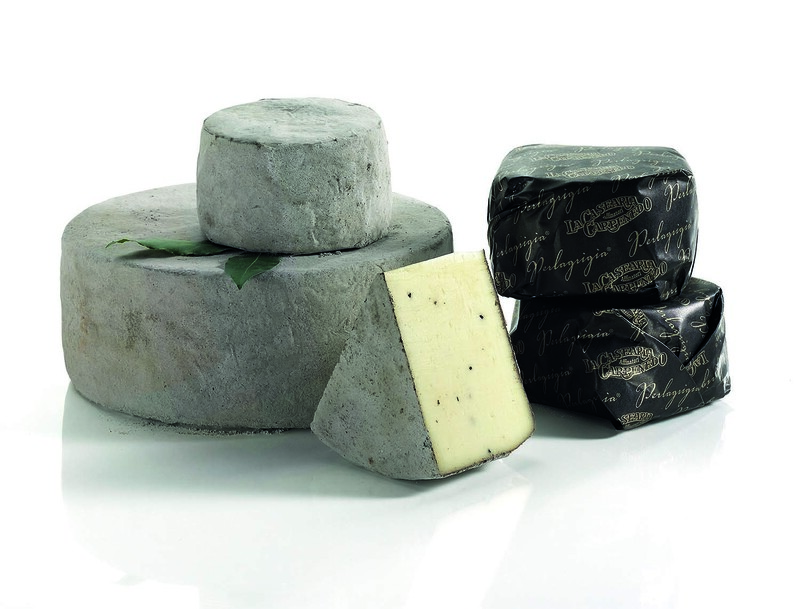 Perlagrigia translates to “gray pearl,” a perfectly fitting name for this exceptional and stunning cheese. Made with local, pasteurized cow’s milk and real black truffle slivers sprinkled throughout the semi-soft, light-yellow paste, Perlagrigia is aged for just one month. During the maturation process, the rind is rubbed with extra virgin olive oil and natural truffle oil, finished under a layer of ash to preserve the cheese’s extraordinary flavor and to prevent the paste from drying out. The light gray colored ash is a blend of beech wood and dried, finely ground cloves, cinnamon, nutmeg, coriander and licorice, all of which are grown by local farmers using time-honored cultivation and harvesting methods. The complexity of delightful flavors flows from the freshness of the young paste, punctuated by prized, aromatic black truffles, to the herbaceous and edible outer rind. Intense, yet smooth, sophisticated and balanced, Perlagrigia is the pearl of La Casearia Carpenedo. Application: Unique in presentation and flavor, Perlagrigia is first thought of as a table cheese, especially for special gatherings, or for part of an antipasto course. However, Perlagrigia will incorporate beautifully into egg, polenta and risotto dishes. It makes an elegant grilled cheese sandwich or cheeseburger and elevates salads. Pairing: Keep to the northern Italian theme and pair with red Barbera or a white Gavi both from the Piedmont. Family owned and operated since 1951, Riseria Cremonesi believes in great tasting and authentic cooking through simple, genuine ingredients. 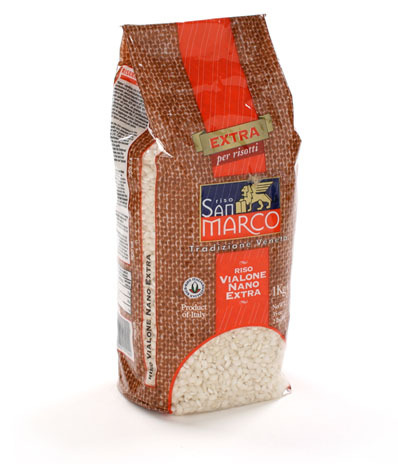 Vialone Nano Italian rice is a medium grain, semifino (semi fine category, making it shorter and thicker in appearance than Arborio rice), first created in the Mantova and Veneto regions in 1937 by crossing the Vialone and Nano rice varieties. Vialone Nano rice immediately became known as an incredibly versatile grain that appealed to the most demanding gourmands. Vialone Nano rice is especially excellent for making hearty risotto dishes, such as Risotto with Perlagrigia, since each full-flavored grain can hold twice its weight in liquid. It is also wonderful paired when with fish.